Have you ever noticed that most of the texts about hospitality in the New Testament refer to relationships within the Christian community? “Your love for one another will prove to the world that you are my disciples” (John 13:35). “Love each other with genuine affection,[a] and take delight in honoring each other” (Romans 12:10). “Share each other’s burdens, and in this way obey the law of Christ” (Galatians 6:2). “Be kind to each other, tenderhearted, forgiving one another, just as God through Christ has forgiven you” (Ephesians 4:32). “Let’s not merely say that we love each other; let us show the truth by our actions” (1 John 3:18). That’s not to say that every verse about hospitality is directed toward insiders; it’s just an observation that most are aimed in that direction. I think it’s because unity is essential to credibility. In her book, A Generous Presence, Rochelle Melander says, “They [the early Christians] needed to be told to love and welcome one another because they weren’t doing it” (p. 18). That’s a problem because the credibility of the Christian message is directly affected by the unity of Christian people. Unity is essential to credibility. So, Melander asks, “How could they welcome strangers when they could barely tolerate one another?” (p. 18). A student can remain anonymous in your large group program, but it’s hard to do that in a small group. That’s why small groups are an important part of helping your students grow spiritually. At their best, small groups provide a safe place for students to open up about what they really think, feel, and believe. In a good small group, students learn about faith in an environment of acceptance, openness, and respect. At their worst, small groups foster cliques, judgment, and gossip. In a bad small group, students don’t feel comfortable to talk openly. Instead of respecting each other, students mock each other. Worse, the leader doesn’t step in and lead the group toward a better place. At the end of the school year, students in a bad small group are no better off and no farther along than they were at the start of it. 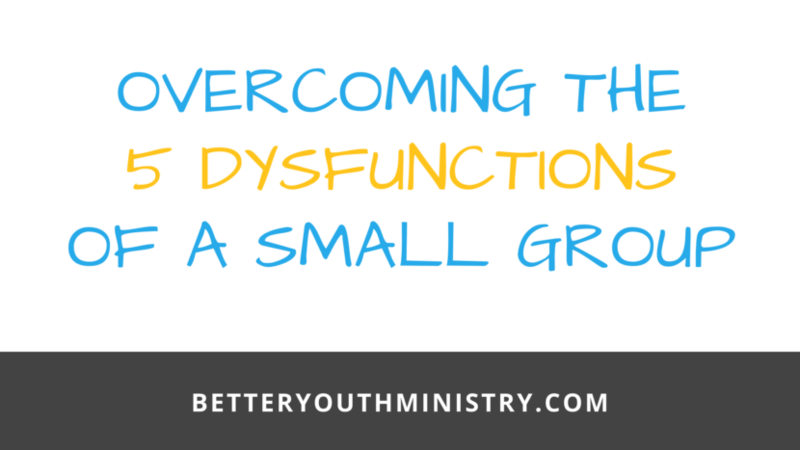 To keep your students climbing up the mountain of faith, you need to create healthy small groups in your ministry. He explains, “These dysfunctions can be mistakenly interpreted as five distinct issues that can be addressed in isolation of the others. But in reality they form an interrelated model, making susceptibility to even one of them potentially lethal for the success of a team” (p. 187). I believe that these insights are equally applicable for your small groups. Keep reading; I think you’ll agree. If your students don’t trust the people around the circle, they will not open up to them. Not feeling the group is “safe” is what keeps students from lowering their guard and getting real. Without trust, students will won’t ask honest questions and they won’t admit troubling mistakes. Create trust. Trust is built over time. A certain level of trust is assumed from the start, but that trust will be either reinforced or broken based on how students treat each other in the group. If the leader shares appropriate struggles with a posture of openness, he or she will set the tone for students to follow suit. Groups that haven’t built trust will not engage in unguarded, unfiltered discussions about real issues. They will nod their heads in agreement, even though they are not convinced about the conclusions that have been reached (or presented). These are the kinds of groups where the students don’t say very much and the leader fills the silence by talking too much. Dig deeper. With trust already established, the group leader should probe further with questions that go beneath the surface. When a student gives a predictable answer, the leader should ask: “Is that what you really think? The student will probably nod. Don’t stop there. Ask: “What makes you think that?” or “Why do you think that?” Involve another student in the group. Invite him to push back. Say, “David, if you weren’t a Christian and you were sitting at the lunch table, what would you say to shoot down Ethan’s answer?” Then, let them talk it out. Go deeper. Encourage students to explore alternative perspectives and angels. When students sense that the group is not enriching their faith or adding value to their lives, their commitment will evaporate. The stated purpose of the group is to help students develop healthy friendships and experience spiritual growth. However, the absence of trust and fear of conflict have prevented those things from happening. That realization (stated or unstated) is what causes students to choose to use their time doing other things rather than attending the group. Follow up. The group leader should call or text every student who misses a group meeting. Sometimes, the student had another thing on the schedule that couldn’t be avoided. Other times, their absence is the first sign of a step away from the group. In that contact, the leader should communicate care, and cast vision for what will happen at the next group meeting. The emphasis should be placed on the purpose of the group, and how the next meeting will contribute to it. Also, students will miss if you don’t communicate details in a timely way. Be sure to overcommunicate the details of the group. This includes things like dates, times, and locations of group meetings and get-togethers. Students (and their parents) get frustrated when they don’t know what’s going on from week to week. If the purpose of the group has not been clearly explained, it will be hard to hold anyone accountable for their role in achieving it. Students need to have roles in their small groups. These roles can rotate each month or semester. Without clearly defined roles, the students will wait for the group leader to do everything. Instead of owning their part of the group (which creates buy-in), students without roles become passive consumers who only attend when it’s convenient and there’s nothing else to do. Ironically, asking students to just show up hurts rather than helps the commitment level of the students in the group. Assign roles. Give each student a job to do, a task to own. This can range from texting the prayer requests to the group members after the meeting to organizing who will bring refreshments to the next meeting. The roles should be included tasks that make it obvious whether or not the person followed through. This is the final stage of dysfunction. It is demonstrated in a complete lack of care toward the group, its members, or its purpose. Students have entered this stage when they consistently choose to do other things instead of showing up at and participating in the group. They don’t care, and they don’t care that you know they don’t care. Start over. You can’t overcome this stage. The group has completely lost its sense of direction. It no longer cares about its reason for existence. Maybe it was just bad timing. Maybe it was bad leadership. Who knows? Whatever the reason, it’s time to end the group and start over with a new one. Effective small groups don’t just help students develop healthy friendships and experience spiritual growth. They also demonstrate to those outside of the Church that Christ has truly made (and is making) a difference in our lives. Again, unity is essential to credibility. When we help students come together in community, we help others see credibility in the Christian message. Trevor Hamaker helps youth pastors create momentum, reach students, and grow faith in their ministries. He has over a decade of ministry experience, along with degrees in business management, organizational leadership, and religious education. Sign up to get updates sent to your inbox each week! You're in! Want more ideas and support for your ministry? Check out the BYM Community! These TOOLS will save you loads of time EVERY WEEK! 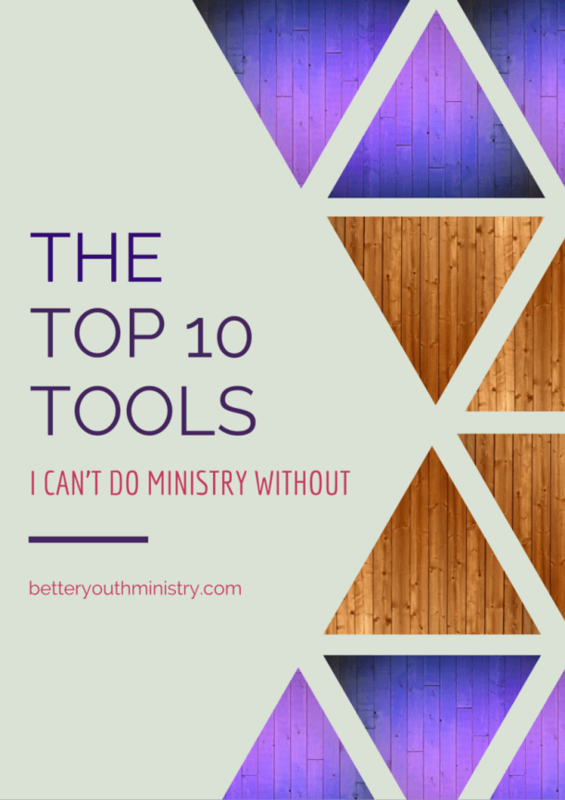 This valuable list of tools that will save you time and help you do ministry better! Want more ideas to move your ministry forward?